The images below: #1 (logo), #2 and #3 (travelers), #4 (book), #5 (calling card), and #6 (postcard) may be reproduced for editorial purposes provided the URL <http://www.postcardsfrom.com> is also clearly published. Adventurers Kenneth Rhodes and Priscilla Faith Rhodes in front of the rig that will take them to all 50 states. Midway through the journey, Priscilla and Ken Rhodes in front of their rig "Ruby and Harvey." 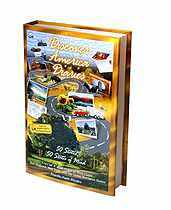 "Discover America Diaries: 50 States, 50 States of Mind, Volume 1. East Coast to West Coast: New England, New York, and the Great Northern States." 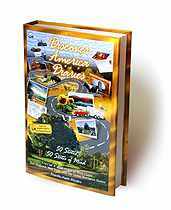 "Discover America through postcards" calling card. Live-at-the-Scene postcard from the Route 66 Museum in Oklahoma.